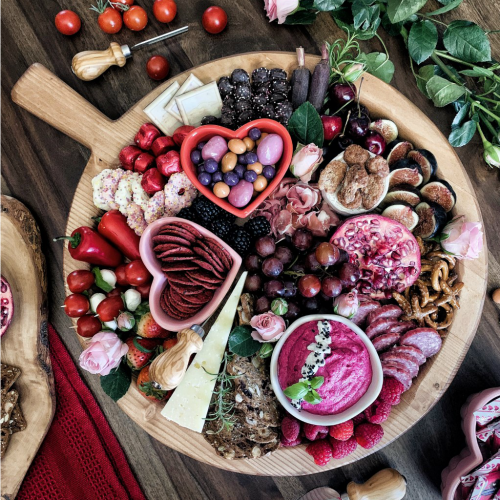 We love to cook a special dinner at home for Valentine’s Day, but this year, I wanted to put together a Valentine’s Day charcuterie & treat board that both my husband and kids could enjoy. It was so much fun to put this together for the blog—great practice for when I do it again later this week! Most of the items I feature are from Trader Joe’s, including the chocolates, cookies, beet chips, nuts and chocolate-covered fruits. Those “Pinks and Whites” cookies are to die for, by the way.. sooo good! The XO pretzels and heart ramekins are from Target, while the tray/board is from etúHOME and is about 16.5″ wide. 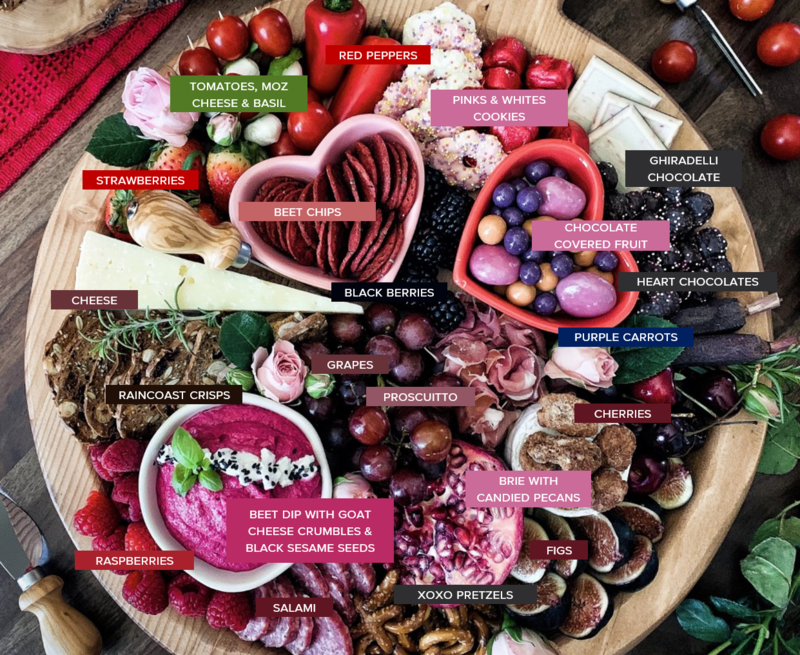 My strategy was to use as much red, pink and purple on the board and then organize loosely by color and type (grouping all the treats together). I used this recipe for the beet dip (found it on Pinterest) and it was quite yummy. I did pull back on the beets just a bit to avoid too much of an earthy taste. And lastly, I used small garden roses and rosemary twigs to garnish and decorate. I love how pretty the result was… and how yummy! There’s no wrong way to organize a board. Add whatever your family loves to eat, and throw in a few surprises. I love going out of my way to get nice crackers, nice cheeses and meats, but other than that, it’s about having fun with food and stirring up good conversation. I’ve always felt a board meal slows you down a bit, and I love that so much! 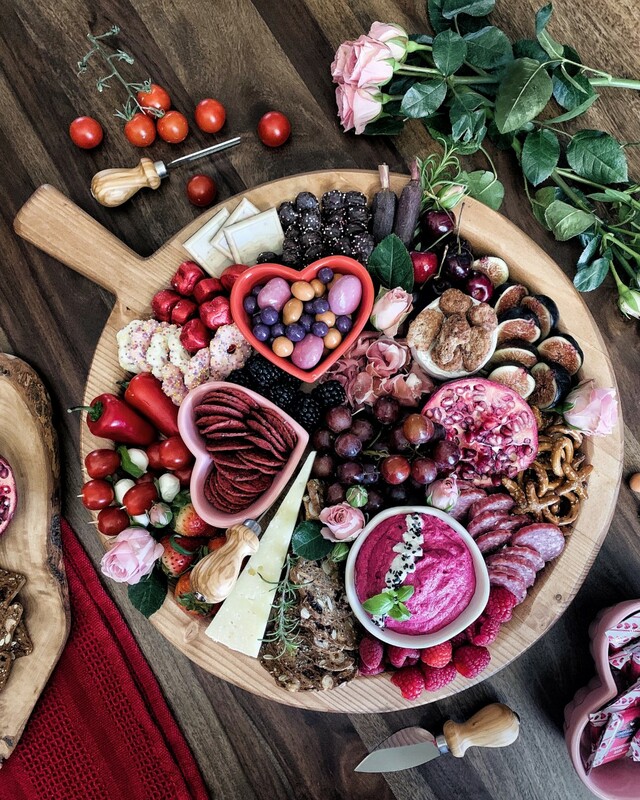 I hope this board inspires you to create your very own Valentine’s Day meal to share with those you love the most!